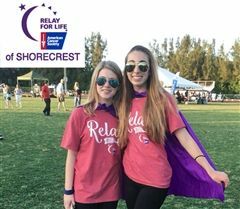 2019 marks the 14th year of Shorecrest hosting a Relay For Life on campus, a student-run event. Shorecrest has raised an outstanding total of nearly $1.2million since 2006 benefiting American Cancer Society! This year's returning Event Co-Chairs are Olivia Olson '19 and Jordan Tralins '19. They have done an incredible job balancing Relay planning along with all of their other responsibilities, and have created an amazing night for all Chargers to look forward to on March 29! !